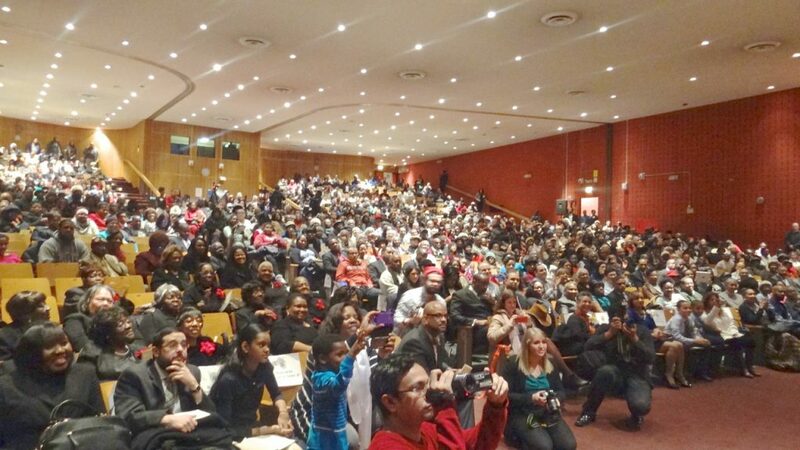 Congressman Hakeem Jeffries (D-8) held his State of the District Address– his first since taking office— Thursday night to packed house of about 900 people at Bed-Stuy’s Boys and Girls High School, in which he offered a review of his most recent work in Congress and his plans for the district in 2014. Jeffries’s 8th District includes the neighborhoods of Fort Greene, Clinton Hill, Bed-Stuy, East New York Howard Beach, Mill Basin, Canarsie, Bergen Beach, Manhattan Beach, Brighton Beach, Coney Island, Seagate, and parts of Ozone Park, Flatlands, Prospect Heights and Brownsville. 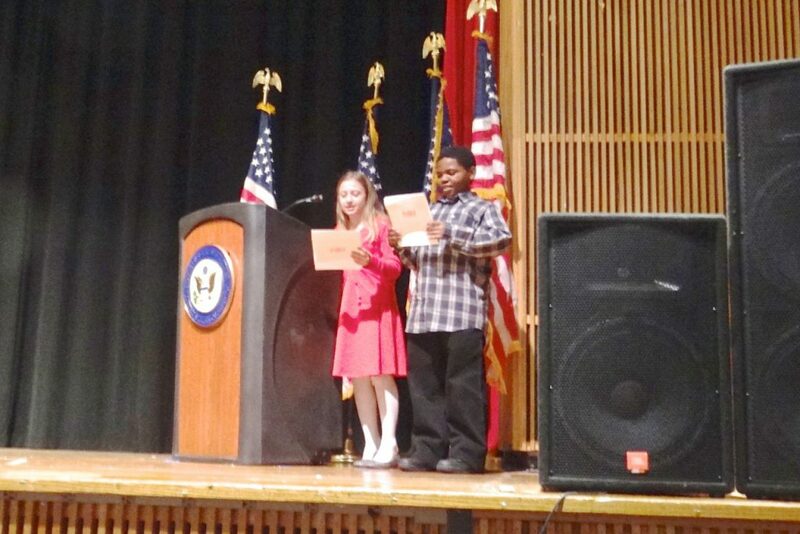 The Congressman’s address, which lasted about 90 minutes total, opened with a welcome by Judge Betty Staton, executive director of Bedford-Stuyvesant Community Legal Services, who also served as the evening moderator. An invocation by Rabbi Yisroel Perelson of the Flatbush Park Jewish Center and a poem, dance performance and musical selection by local public school groups followed, before Gregory A. Taylor, Jr. and Fiona Oztan of P.S. 11 introduced the congressman. Jeffries began with a video presentation highlighting his most recent legislative accomplishments, which he also spoke about briefly, including his support of the Affordable Care Act, his opposition to the government shutdown in December, and his own federal fist in demanding the government pay attention to and address Brooklyn’s hospital crisis, namely the possible closing of Interfaith Hospital in Bed-Stuy. Tightening gun laws, raising the minimum wage and addressing climate control, were amongst the big-ticket items he planned to get behind as a legislator. They were popular issues with his constituents that echoed much of U.S. president’s own goals. “The failure of Congress to act on strengthening gun legislation has created a patchwork of inconsistent laws that leave our community vulnerable to the looseness of laws in other places,” said Jeffries, reminding the audience of how many of the guns used in NYC were purchased in Virginia; in Chicago from Indiana; and in Los Angeles, from Arizona. He added, in a city that is one of the richest in the world, New York City residents are struggling to provide basic shelter for their family. But he also customized his to-do list to fit the needs of his district, detailing his plans to enact programs that will identify and meet the needs of at-risk youth; to continue putting pressure on Washington to meet its financial obligations with the Hurricane Sandy cleanup, including erecting a sea wall to help protect residents from future disasters; and to introduce a brand-new comprehensive plan for keeping housing affordable in places like Bed-Stuy, East New York and Canarsie. “I represent a lot of beaches,” said Jeffries. “These communities are filled with hard-working individuals whose lives were turned upside down when Superstorm Sandy struck our shores. “Places like Bed-Stuy and East New York have the highest foreclosure rates in the city, with huge property tax increase in places like Ozone Park,” Jeffries said. “All over, people are being pushed out, and it threatens the socio-economic, cultural and artistic diversity that makes us strong. “There have been far too many luxury housing developments going up. And who can afford them? Nurses, social workers, transit workers, fire fighters? They were not built for them. “[Luxury apartments] artificially inflate the housing market. I am proposing a moratorium on luxury apartment construction until we can put into place a comprehensive affordability plan at all levels of government,” said Jeffries to thunderous applause. Jeffries added, this month he also will introduce legislation that changes the 80/20 Federal Housing Program, in which at least 20 percent of the units must be set aside for households with incomes at 50 percent or less of the local area median income, to a 50/50 set-aside ratio.